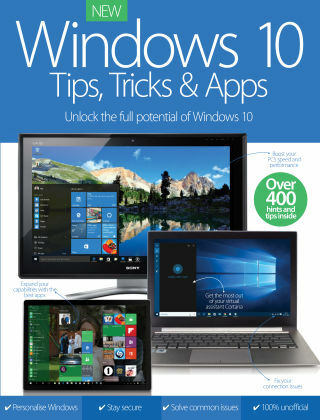 With Readly you can read Windows 10 Tips, Tricks & Apps and thousands of other magazines on your tablet and smartphone. Get access to all with just one subscription. New releases and back issues – all included. From the return of the Start menu to the introduction of the new Edge web browser, Windows 10 is packed with brilliant features, abilities and apps that aim to make your computing experience as compelling as possible. But while Windows 10 is absolutely accessible to newcomers and veterans alike, some of its more powerful settings and features may not be immediately apparent. That's where Windows 10 Tips, Tricks & Apps comes in. In this bookazine we'll talk you through how to get the most out of Microsoft's built-in apps, how to tweak the OS to fit your needs, how to solve issues and which of the thousands of apps available from the Windows Store are really worth your time.